Passed away December 2, 2018. It is with great sadness the family annouce her passing in her 94th year. A loving and devoted mother of Brian, daughter-in-law Virginia and grandson Darcy. Funeral Service will be held in S & J Irvine's Funeral Home, 48 Rashee Road, Ballyclare BT39 9HJ on Wednesday 12th December at 1.30 p.m. Followed by interment at Roselawn Crematorium at 3.00 p.m. 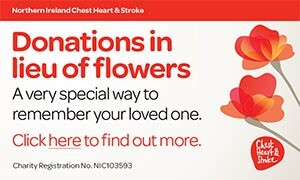 Donations in lieu of flowers, if desired, to Chest, Heart & Stroke Association c/o S & J Irvine at the above address. (Cheques made payable to charity please). I am sorry to tell you that Helen SMYTH has passed away.